Chicago is a major American city in the state of Illinois. Its population is over 2.7 million people, making it one of the largest cities in the country. It is known for its architecture and skyscrapers, museums, and unique local food. 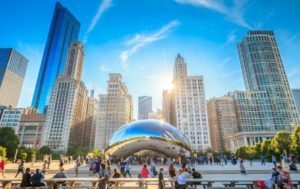 Chicago is extremely popular among tourists and also attractive to those who seek to relocate because of its large and diverse economy. All of that makes Chicago a common destination for auto transport. So if you are looking to ship a vehicle from Charlotte, NC to Chicago, IL, you can save money, as car carriers charge less for common routes. Looking to ship a vehicle from Charlotte, NC to Chicago, IL? There are over 700 miles between Charlotte, NC, and Chicago, IL, and you would have to spend over 12 hours driving if you decided to move your car yourself. It is not just a long and tiring drive. It can also turn really expensive because you need to pay for gas and might have to stay in a hotel. If you analyze the expenses, you will see that if you choose to ship your car instead of driving it, you will save money. Charlotte Car Transport ships all types of vehicles all across the country. We can help you with Chicago car shipping from Charlotte and transport your car door-to-door. Our company provides affordable options for your auto shipping, and we will make sure you get the highest quality services! It is simple to ship with us. Start by getting a free quote by requesting it online or calling our office. Our agents will be happy to answer all your questions and provide you with all the required info. We are looking forward to shipping for you!